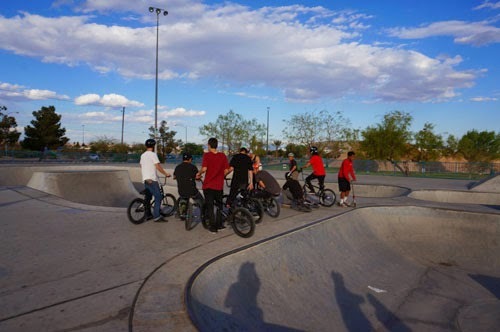 The 2014 Extreme Thing Sports & Music Festival is back for its 18th year at the Desert Breeze Skate Park (8275 Spring Mountain Road, Las Vegas, NV 89147 ) in Las Vegas March 29 from 10 am to 10 pm. The event has four stages with a lineup of 24 bands and 10 DJs. Two main stages are featuring 7 top national acts and three side stages featuring 9 hot up and coming bands, among others, Taking Back Sunday, The Used, Killswitch Engage, Bring Me the Horizon, Emmure, Of Mice & Men, Thy Art is Murder, Volumes, Issues. None of the following will be allowed at the festival: cans or bottles, alcoholic beverages, coolers or food, glass, paraphernalia, weapon (with or without a permit) sticks, balls, bats, chains or clubs, blow horns, balloons, bikes, skateboards, pens, markers, umbrellas, lawn chairs, small stadium seat or low-back chairs, video equipment, squirt or water guns, unauthorized vending, concessions, merchandise, literature of promotions, or live animals.